This entry was posted on 22nd September 2017 by WoodBlocX. 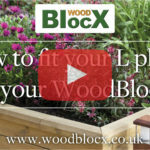 In a WoodBlocX construction – from a raised bed to a retaining wall - the capping and the BlocX beneath it both have a joint at the corners, and these corner joins are susceptible to opening slightly over a period of time and leaving a small gap in the corner capping. The steel L-plates devised by WoodBlocX solve this problem by bridging the corner joints and helping to prevent this. They are simple to install and also add strength to the construction. Watch the above 50 second tutorial video to see how they work.